He's known for his metallic side in the multi-platinum selling Godsmack, but it turns out Tony Rombola is a man of hidden blues depths. "I had an SG copy. Tony Iommi inspired me to play. It sounded so dark, heavy and cool. That was it. Iron Man was probably the first song I ever learned. Once I learned a root 5th to do a bar chord and I slid that around, I could do a lot of his songs." "Never give up. Sully Erna [Godsmack frontman] drilled that into my head, early on. He'd always say, 'The guys that don't make it are the ones that gave up.' It made sense. Don't stop. If you've got something going, just keep trying." "I was never really into metal [growing up], I was a classic-rock guy with Hendrix, Zeppelin, Black Sabbath, The Who and Gilmour. 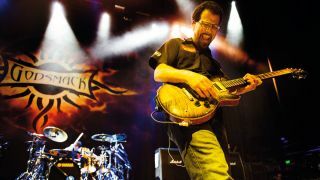 "When I joined Godsmack, that was my first metal band, really. So the guitar players I would study were more classic rock and a lot of that is blues-based. That's where a lot of that comes from." "I have a blues band back home [in the USA, Blue Cross, also featuring Godsmack drummer Shannon Larkin] and we invited Eric Gales to jam with us. He's one of my heroes. "I was into him when he first came out in the early 90s and now he's blossoming into a monster player, so he's someone I could definitely learn from." "Practise standing up. I remember when I was a kid I would sit down to play a lot. And then when I went to play live, it really throws you off. Practise like you're going to play live would be my advice." "We toured for one full year in America and Europe with Metallica, and they were such pros. They are a band we strived to be like and look up to, because they've got it all. They're on the top of the pile. "Next thing I know, I'm showing him how to play The Rain Song. A pretty cool moment for me. He's a really nice guy." "Godsmack played for about a year in clubs, but it built up. Our first Ozzfest is when we started seeing the big reactions. And we went Gold that first year on that first Ozzfest [half a million record sales]. "Our songs were on the radio and we were playing to these crowds. That was probably the moment that I realised, this thing is really going. I didn't know how far, but it was definitely going at that point." "I just got into using fuzz recently because of the blues thing. I've used overdrive and distortions in the studio a lot, and high-gain amps with combinations of the two. But fuzz is a new experience for me and I'm really digging it. "I've got a Mojo Hand Colossus. That one isn't full-on fuzz, it's kind of distortion fuzz and I think that's why I like it; I mix it back and forth better. It's a little more distortion than full-on raunchy fuzz. It's for the blues band but for the next Godsmack record, I'm certainly going to have them around." "I want to put out this blues record with my band Blue Cross. Me and Shannon [Larkin, drummer], we have other bands, too. "We had a rock band called Another Animal. We have a funk band, too. I want to keep making music. I have another side to me that nobody really knows about because nobody gets to hear it, where I'm playing a Strat and playing blues or funk. "It's way different and fun for me. To be a diverse musician, to write and record different styles of music and just get better, that's really my goal." Godsmack's latest album 1000HP is out now on Spinefarm.